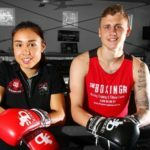 The Queensland Bantamweight title was up for grabs last Friday night in Townsville when 2 time Olympian Brad “P-Rock” Hore challenged Tommy “Gun” Clark in his hometown on a card put together by Joe and Natacha Pennisi. Brad controlled the bout from the outset and outpointed Clark convincingly to take the title by Unanimous decision , 78-72,78-72,77-73. It was a great feeling to come away from Townsville with the Qld title belt and even though Brads support crew was outweighed by 50-1 (for the first time),it was a memorable occasion for Brad and the team. 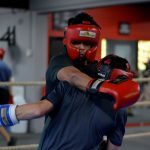 This weekend sees amateur boxing change rules (to the professional scoring system)and the headguards will come off all senior elite males with our own Mitchell Coomer boxing Qld champion Peter Lazarus in a challenge match,with the winner going on an interstate tournament to South Australia. We have been preparing for the change in rules since January this year so we will see how our team go.